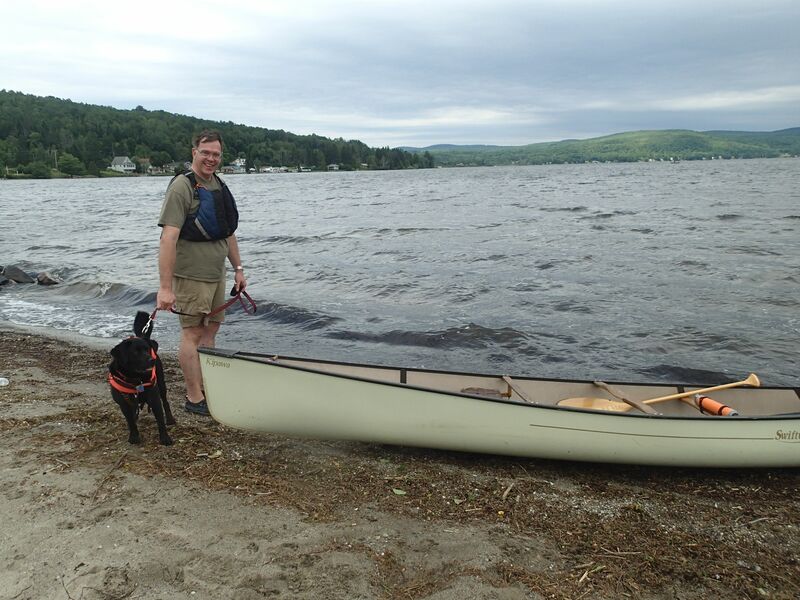 A Week of Wipe-outs…on land and ( nearly) on the water | Vermont Paddle Pups! Wheww…that was close! That expression was muttered more than once in the past few weeks, but we’ve survived with only minor injuries, and a mostly dry boat. A recent spate of oppressive heat and humidity has limited our hiking activity…and the holiday weekends (Canada Day and USA 4th of July) have resulted in crowded waterways. 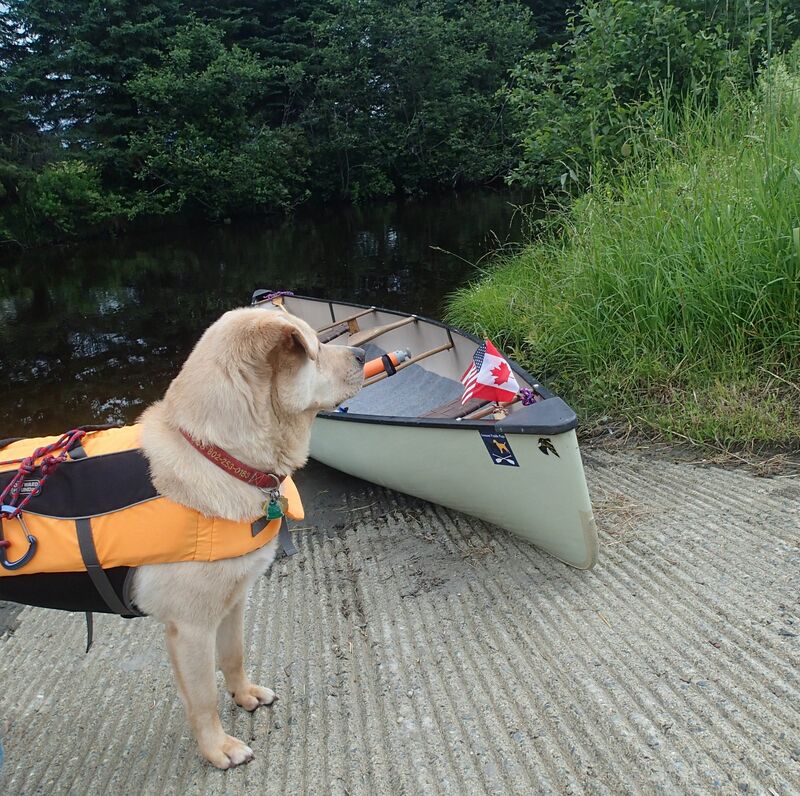 After an early morning paddle last weekend, we let the dogs practice their natatorial skills. 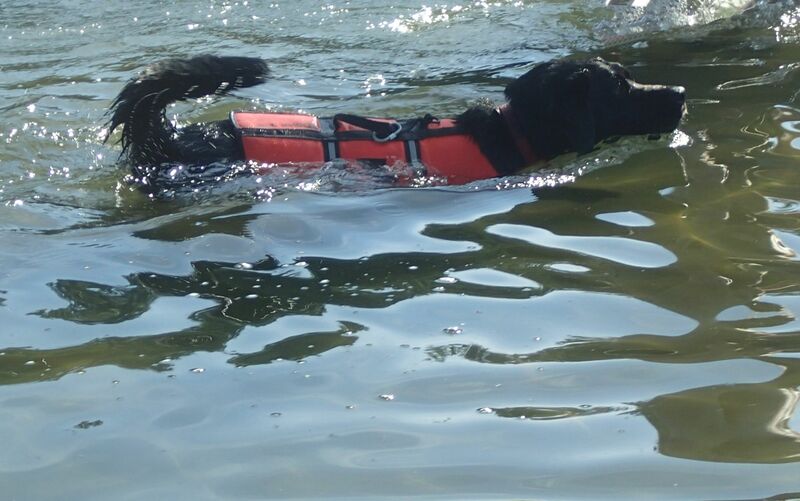 Neither of them despite their obvious Labrador heritage, is an avid swimmer, so we like to have them get more comfortable swimming with their life jackets on…Just in case. 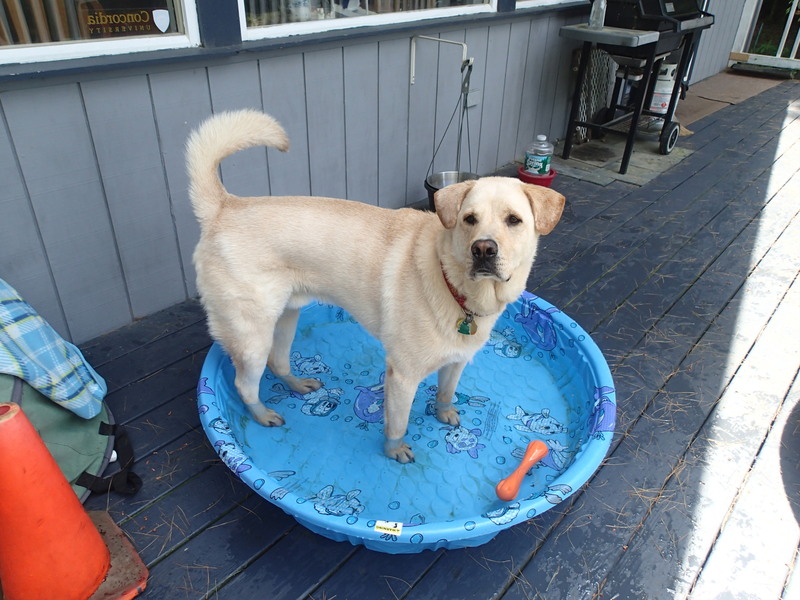 At the house, their Labrador instincts do kick in, and the kiddie pool is recognized as a place to stand, and cool off! 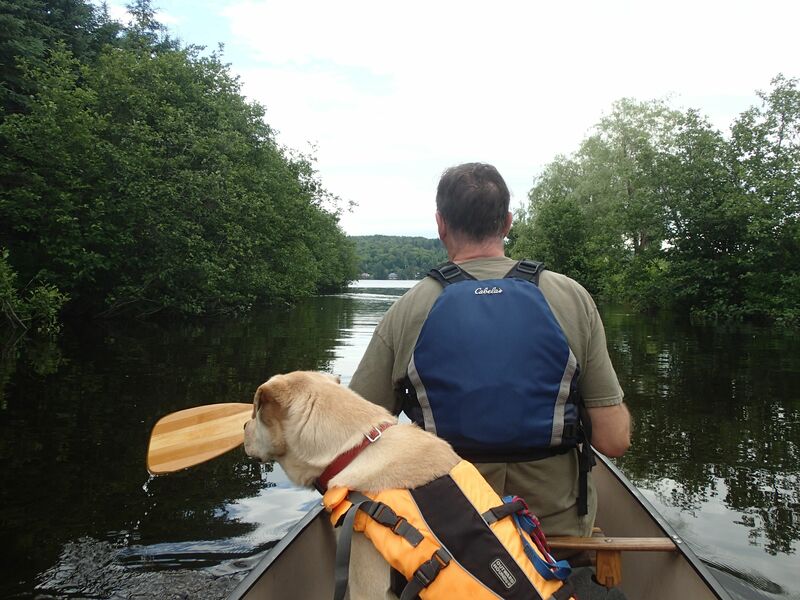 We had planned an “international paddling day” for July 4th. That is, paddle two lakes near the Canadian border, the second of which involves paddling across the border. A few phone calls to US Border Patrol, and CBSA in Canada, and we were legally ready for the trip. However, Mother Nature had different plans, and the 4th was a stormy, rainy day. 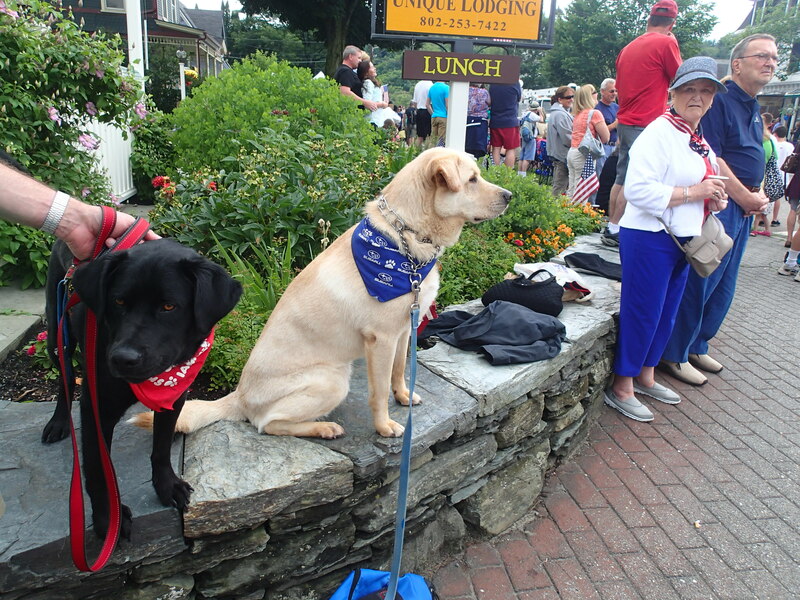 We were able to get to a parade, and the dogs were quite well behaved, despite the obvious chaos and noise. Our trip was postponed again, when July 5th was marked by the tail end of Hurricane Arthur, and high wind warnings. To keep it simple, we headed off for a few hours to a trail network near our home. 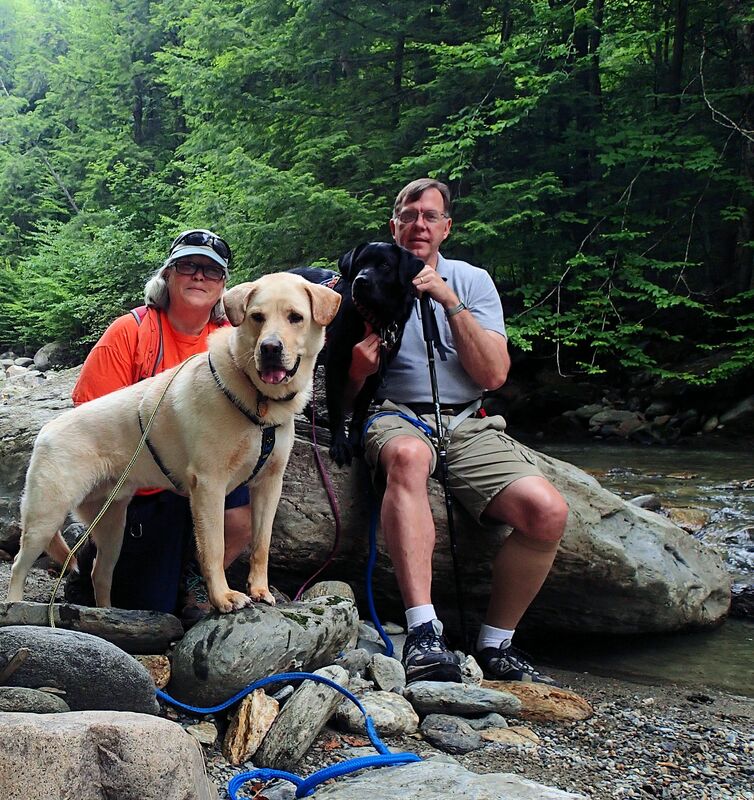 Usually a simple, uneventful few hours, but not today….After letting the dogs splash around in the river, and taking the obligatory photos, we headed back to the trail. I inadvertently stepped on a loose river rock, and tumbling down I went. Initial fears that I had broken my femur were unfounded, thankfully….after a short break, I hobbled the few miles back to the car, the proud owner of a lovely deep bruise, 5 inches across. Silly, when I think of all the tough climbs we have done, and I wipe-out on a river bed. So, early Sunday morning, we are a determined crew heading off to the Northeast Kingdom. A light breeze is blowing, but the skies are sunny, T’Pau ( our GPS) has our route mapped, and in 2 hours we are .25 miles south of the Canadian border. Flying both flags, of course…. We put in at the state fishing access, and paddle a narrow channel out to the main body of the small (500 acres) lake. A family of ducks accompanies us, so the dogs are quite alert. We start paddling into the gentle wind, not quite sure where the border is (no signs out on the lake!). We make a call to CBSA marine reporting, but of course, the cell phone coverage is nil, so our Canadian Invasion has begun without official authorization! The lake is quiet, though we note it is more “built-up” with camps and cottages than most of our paddling destinations. Since the wind seems mild, we decide to go up the west side, cross by a marshy area, and paddle down the east side, back to the USA. All is going fine, until we notice the wind pick up, and gusts begin to blow quite firmly. The sky to the north is darkening (despite the forecast), and the tail wind we have begins to be accompanied by larger waves and a cross wind. We keep heading south, steering and quartering the boat as best we can, often having to paddle on the same side of the boat; realizing there is no safe way to now cross the broad lake, we head for a beach on the southeastern end of the lake. We think that it is on the US shore, but we figure if we create an international incident, so be it…. We had made the wise decision to come ashore when we did…as Griff and I walked the 1.5 miles west to retrieve the car, the dark clouds lightened, the sun came out again….but seeing the whitecaps and waves clearly reinforced our decision! 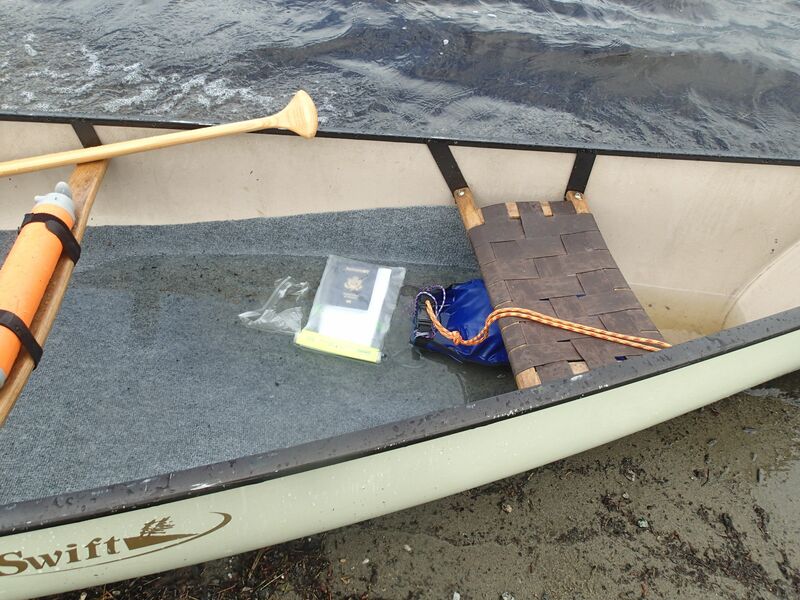 Well, the dry bags kept our passports and rabies certificates dry! 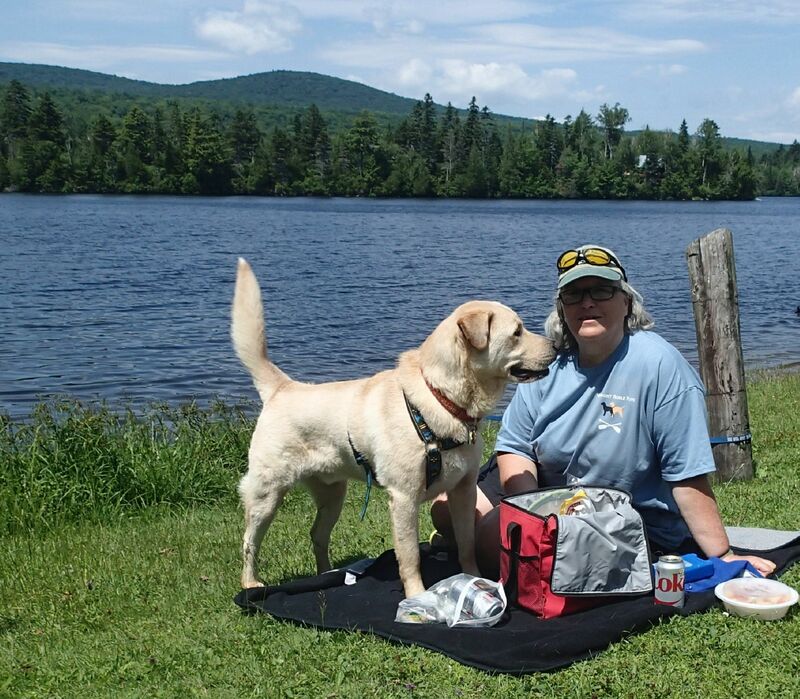 We did check out the other lake we had thought of paddling…but the winds had picked up, well over 20 mph, with gusts higher, so we stayed on land and had our picnic lunch. And of course, the dogs were so well behaved in trying conditions, that they deserved a stop for a creemee on the way home. ← It Doesn’t Get Much Better Than This…..